Hi! 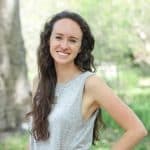 I just got back to Raleigh after being out of town for the past 5 weeks, spending most of that time in Arkansas for an internship. On my drive home, I stopped for a few days in Atlanta and my next post will be all about Atlanta adventures. 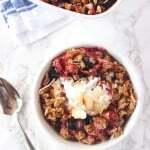 For now, though, I wanted to share a recipe for this healthy mixed berry crisp before summer’s over! I came up with the recipe while I was housesitting for my grandparents in Arkansas. I wanted to use some of my free time to bake and test a few recipes for the blog, but I was the only one there to eat the things I made. What a dilemma, right? 😉 The berry crisp turned out even better than I expected, and after several days of eating it all by myself in Arkansas, I’m actually planning to make it again for a family dinner tomorrow night. 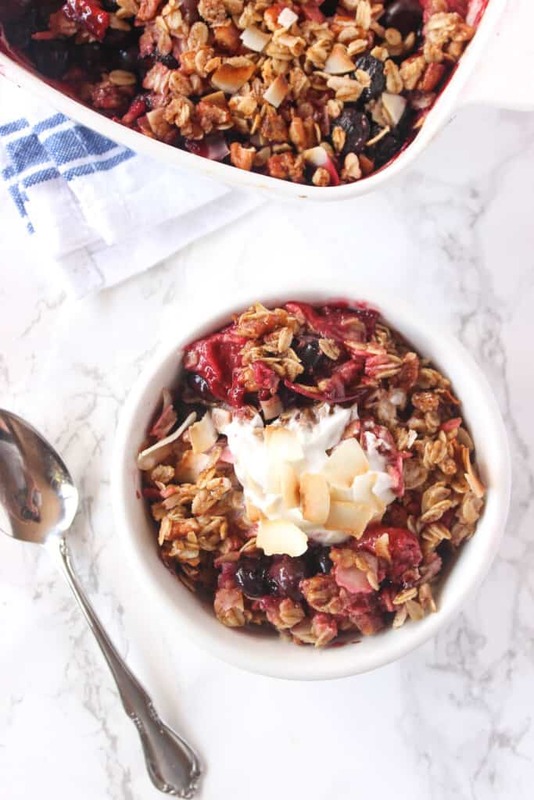 I used inspiration from a few other recipes to come up with my recipe for this summer-y, healthy mixed berry crisp. For the filling, it’s just berries, lemon juice, and cornstarch. I actually found organic cornstarch in the bulk bins at Whole Foods, which is a plus if you have a WF nearby and don’t want to have buy an entire box of cornstarch that’ll end up sitting around in your pantry. For the topping, it’s oats, almond meal, pecans, cinnamon, butter or coconut oil, and just a dash of maple syrup or honey instead of sugar. 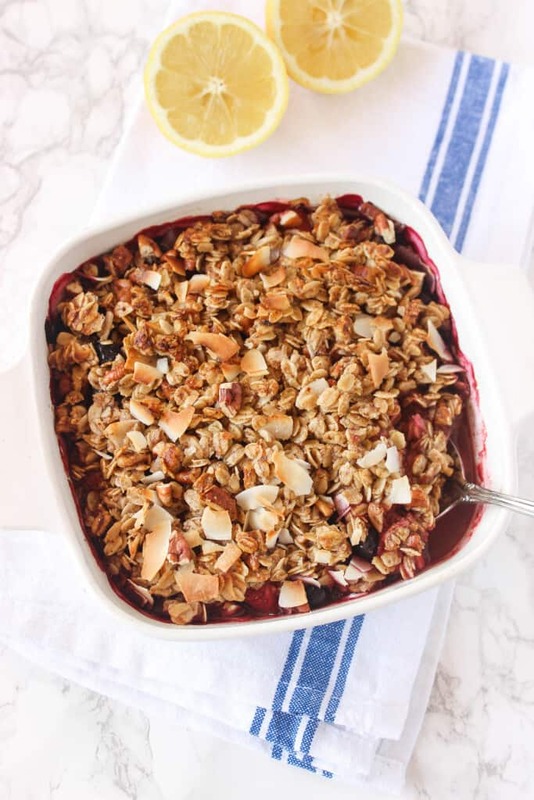 I used coconut oil and added coconut chips to the topping, which is totally optional, but it’s a fun twist on traditional berry crisp if you’re a fan of coconut. Since berries are so naturally sweet, especially when baked, there’s no need to add extra sweetener to them. They also have a wide range of healthy benefits, which you can check out in this post about blueberries from Foodal. To make the crisp, I mixed the filling ingredients together in a medium bowl, added them to my baking dish, and then used the same bowl to mix together the crumb topping ingredients. After 10 minutes and using just one bowl and spoon, the berry crisp was ready for the oven. The filling is naturally sweet and juicy, the topping is crunchy and delicious, and there’s no refined sugar in the whole dessert. As much as I sometimes tend to turn my nose up at “healthy” desserts (i.e. applesauce substituted for oil in chocolate cake), berry crisp lends itself very well to healthy adaptations and you’d never know that this one’s on the healthier side. It’s not a low-calorie recipe by any means, but it’s made with all real ingredients. In a medium bowl, mix together berries, lemon juice and cornstarch. Add to buttered or greased 8x8 or 9x9 baking dish. In the same bowl, mix together oats, pecans, almond meal, coconut flakes or chips, cinnamon, butter or coconut oil, and maple syrup or honey. Mix until mixture comes together and add to top of baking dish. Bake for 25-30 minutes, until the top has lightly browned and the filling is beginning to thicken. Let rest for 15-20 minutes before serving to allow the filling to thicken. Serve warm with whipped cream or ice cream. *If using frozen berries, increase cornstarch to 4 tablespoons to account for the extra liquid the berries will release during cooking. **I bought just the right amount of organic cornstarch in the bulk bins at Whole Foods for something like $.20. 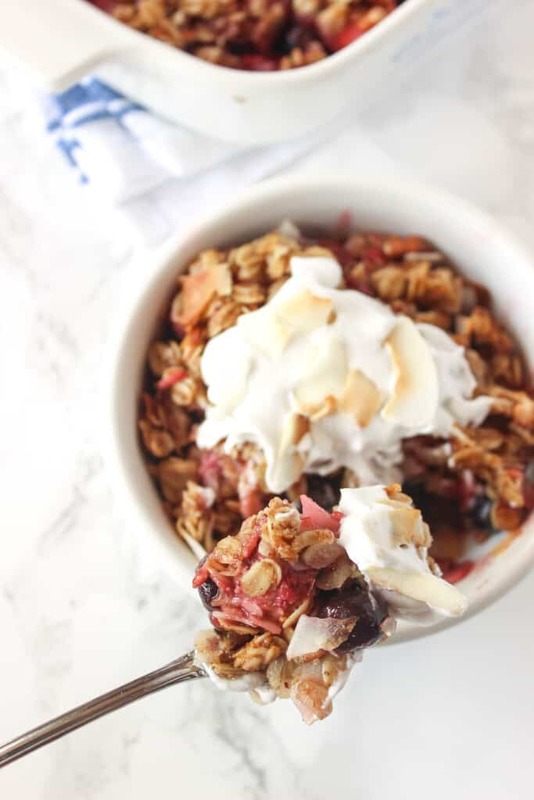 I LOVE apple crisp but I think this summer was the first time I tried making a berry crisp. So perfect for summer and the crumbly topping is always so good. I don’t want berries to ever go out of season! omg Liv i am so jealous. this looks like a dream!! love the addition of coconut flakes on top, and homemade whipped cream sounds incredible. Pinning! I couldn’t get enough! And thanks for pinning, Beverley! Berry crisps are the best! I think I love making healthier versions of them because of the sugar rush that follows! 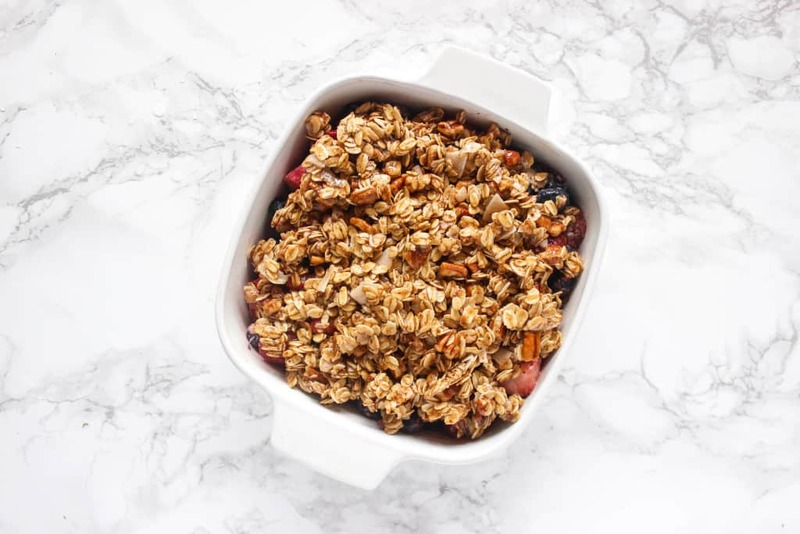 Love that you used the natural sweetness of the berries in addition to honey! We certainly needed for you to make more of this dessert for us. Byron’s favorite! This sounds so good Liv! Definitely would make such a great topping for so many things 🙂 Hope you had a great weekend!! Thanks, Alyssa! Hope you had a great weekend, as well! Looking at this is making me go, ‘Oh boy, oh boy…’ Cause fruit desserts have a really special place in my heart. I love pies and crisps with ALL The real ingredients plus icecream? It’s amazing, because fruit lends so much sugar to a recipe that it doesn’t really need any extra. God made all these cool forms of sugar. Fruit is one of my favorites. 🙂 And Liv, you just always blow me away with your delicious descriptions and incredible looking recipes. Fruit is the BEST kind of natural sugar 🙂 And thanks so much for your kind words, Emily! Yum, rhubarb crisp sounds delicious! I love crisps! Pinning this for a nice weekend breakfast/brunch. I love how you did it in one bowl – that totally motivates me even more. Lots of bowls to clean is not fun! As few dishes as possible is the way to go! Thanks for pinning, Sarah! This looks seriously delicious and I loveeeeeee that you added coconut into the mix! Would this recipe work in individual ramekin dishes? Any change in baking time?